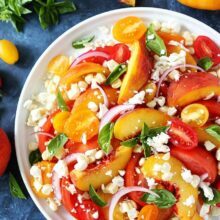 Tomato, Peach, and Corn Salad-this easy and fresh summer salad only takes 10 minutes to make and goes great with any summer meal. Summer cooking is my favorite because it is basically NO cooking! I am all about making easy summer recipes that require no stove, no oven, and no time. I also love summer recipes because of all the fresh produce. There are so many wonderful fruits and vegetables to choose from during the summer months. It makes mealtime easy! 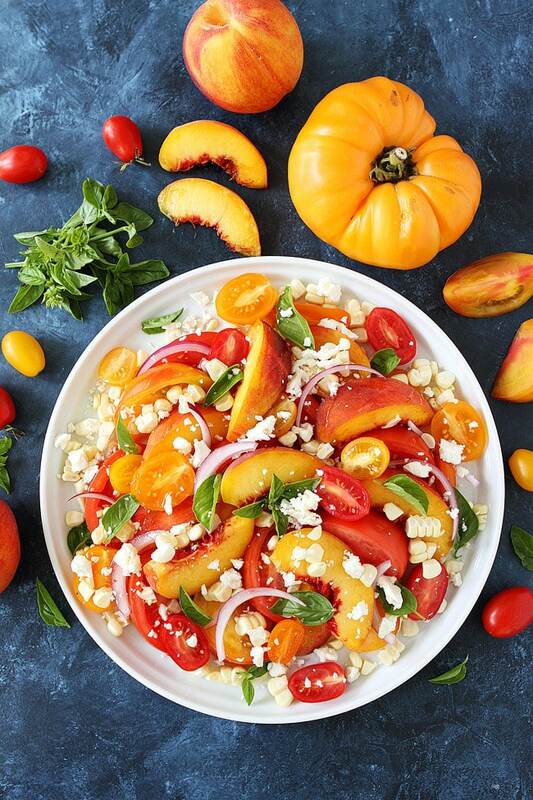 This Tomato, Peach, and Corn Salad is the perfect example of my kind of summer recipe. It requires basically no work, it’s GORGEOUS, and OH SO delicious. Utah peaches are ripe and ready so we are eating as many as we can. We have also been taking advantage of fresh sweet corn and heirloom tomatoes. 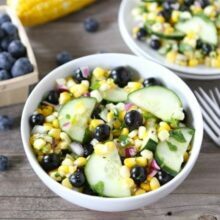 I decided to combine all of my favorite summer ingredients to make a super simple summer salad. And when I say simple, I mean SIMPLE! This salad only takes 10 minutes to make and it’s a real showstopper! 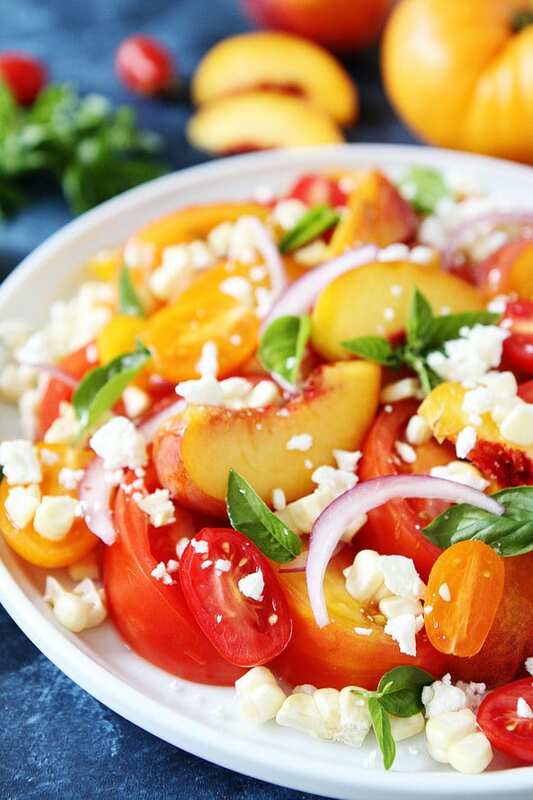 Place sliced tomatoes, peaches, sweet corn, and red onion on a plate or platter. Top with fresh basil and crumbled feta cheese.If you aren’t a lover of feta cheese, goat cheese would also be good. And if you want to make the salad vegan and dairy-free, you can omit the cheese. It will still be tasty! You can stop there, but I like to drizzle the salad with DeLallo’s Golden Balsamic Glaze. It is liquid gold. I LOVE this stuff. 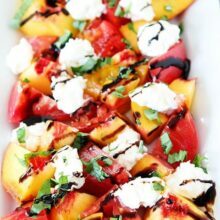 You could also use a regular balsamic glaze, I just like the golden glaze because it blends in with the pretty salad! Serve immediately and enjoy the flavors of SUMMER! 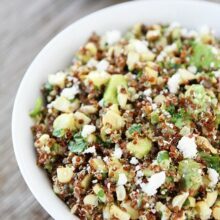 We hope you like this quick and easy salad as much as we do! It is a summer staple in our home. This easy and fresh summer salad goes great with any meal and only takes a few minutes to make. 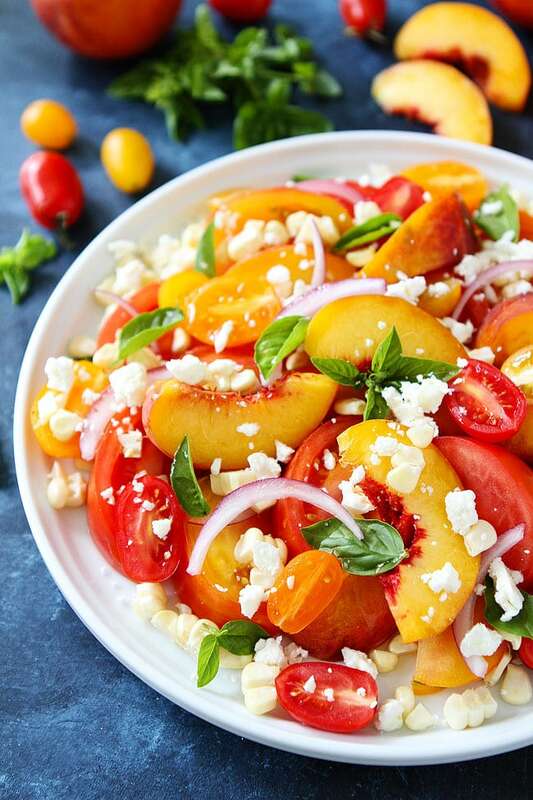 Place sliced tomatoes, peaches, grape tomatoes, sweet corn, and red onion on a large plate or platter. Top with feta cheese and fresh basil. Drizzle with balsamic glaze and season with salt and pepper, to taste. Serve immediately. totally summer in a bowl! I can’t wait to make it! Loved your recipe! The pictures look so vibrant and scrumptious! Who knew fruits and veggies go so well in a salad? Definitely trying this during the weekend. Thank you for sharing! This looks like such a perfect Summer side-dish! I love how simple it is! 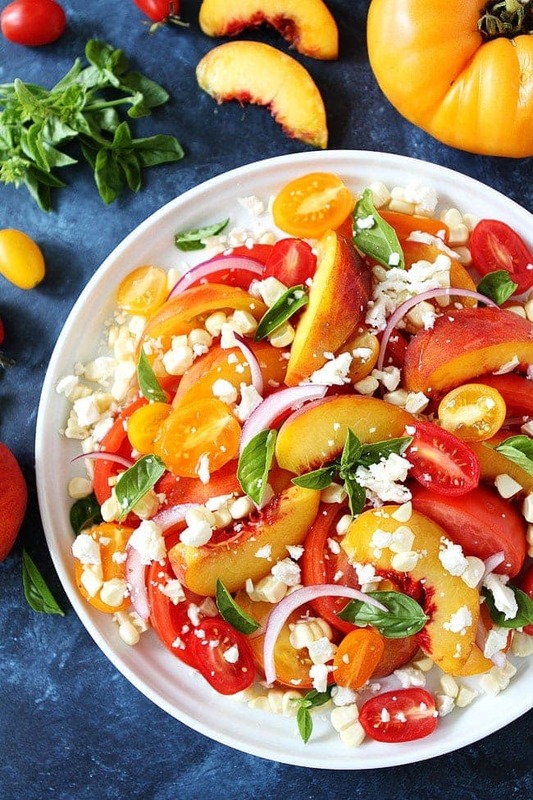 You had me at the combination of peaches and tomatoes! Will definitely have to give this a try! This salad is soooo pretty Maria! love the fresh summery ingredients! 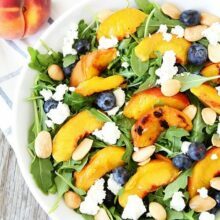 Loving the peaches in this salad! This is SO SUMMERY–I love it! Love the idea of adding the peaches!! I left a comment just now on Instagram about how I tripled the recipe and could have made more. It was so delicious! I did substitute the feta cheese for crumbled goat cheese since I was preparing for three 4 year olds and a 2 year old, in addition to 5 adults. This salad was delicious! We loved it! We cooked the ear of corn with husk on for 4 minutes i the microwave. Took the kernels off the cob, put everything in a bowl with 1 cup of feta and put in the refrigerator for a few hours. It was delicious! We couldn’t get over how good it was. Good with or without the glaze! Thank you for this fantastic salad. I made it as exactly as you did and topped it off with glazed balsamic glaze : to die for!!! !